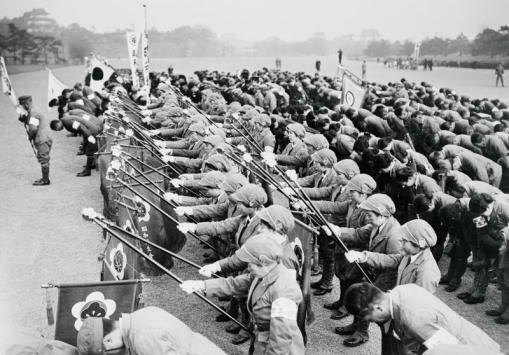 Nationalism and patriotism were going strong in Japan in 1935. This picture depicts the Showa Branch of the Young Women's Patriotic Association celebrating the first birthday of then Crown Prince Akihito (the current emperor of Japan) on January 10, 1935. Students can debate the meaning of the photograph as a means of exploring the issue of the depth of support for the imperial family and patriotism for Japan. For example, does the photograph lend evidence to the premise that support for Japanese nationalism ran deep in Japan and included many women and children? Does it indicate that many young people would feel obligated to participate in public displays of patriotism? etc.